I have a new mantra for travel packing, my friends: pack to please myself. Period. That sounds so obvious, doesn’t it? But since last week when I decided on my wardrobe plan for this trip, I’ve been waffling. Suffering from middle of the night second guessing precipitated by way too much time on Pinterest, and way too many of those bossy blog posts of the “how to pack” variety. Still, despite all this doubt, I’ve decided to stick to my original colour palette of black and white basics. For twenty-three days in Italy, I’m packing only outfits that are comfortable, reasonably polished, and in which I feel well and truly myself. Black and black and blue. Not exciting, but comfortable and covered. Yesterday I finalized my packing lists. 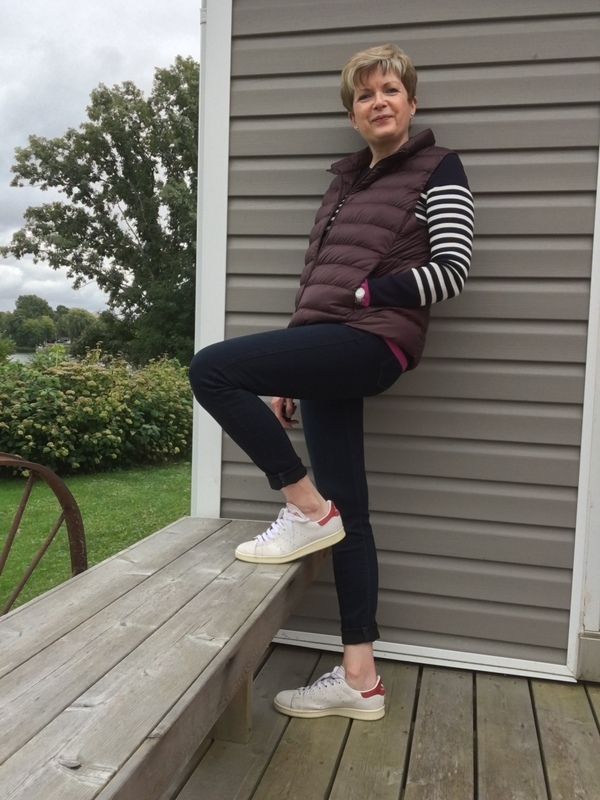 I tried on all the pieces I intended to bring, and decided which pants and tops and shoes were appropriate for each activity, in various weather conditions. Day wear is easy. 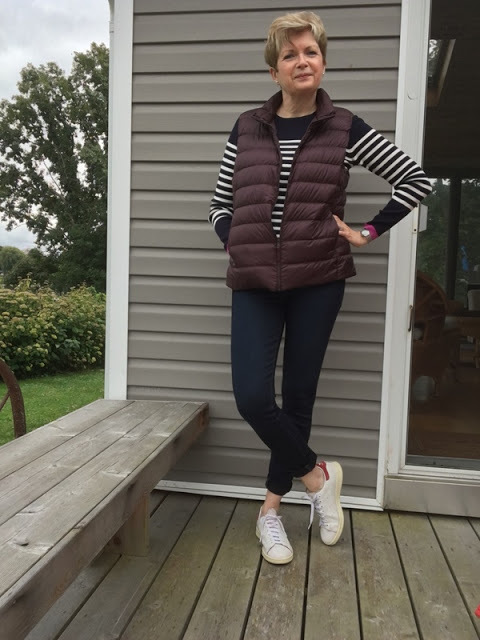 Jeans, short-sleeved or long-sleeves tees with or without a jacket or hoodie, with or without a scarf, with or without a raincoat, and sneakers. But evening wear was frustrating me somewhat. I wanted to smarten up my look a bit for dinner, without packing too many extra pieces to do so. I jettisoned a pair of black leggings for my black, cropped Rag and Bone pants, and added another long-sleeved tee that will work with both the black pants and my white jeans, with or without my Helmut Lang jacket. Below you can see the mess I created on the bed in the spare room as I rummaged and tossed and ruminated. After the bomb, before the sorting. I decided I would pack my new Uniqlo down vest, after all. I love it so much. And because I’m bringing it, I threw in this navy, white, and pink Massimo Dutti striped cotton sweater which I bought to take to South America last year, and haven’t worn since. 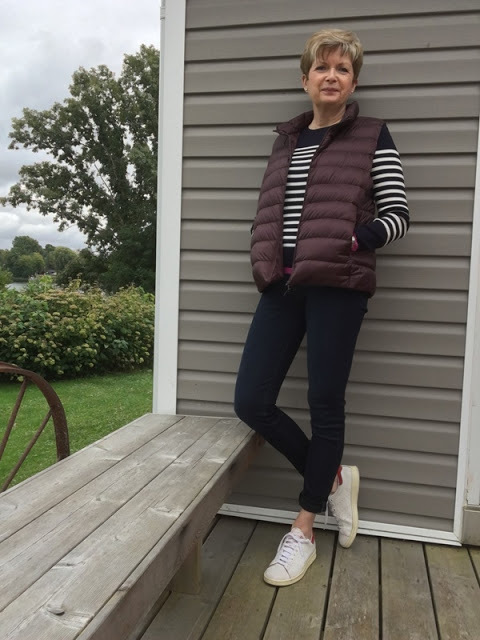 I’d almost forgotten about it until Ann in Missouri commented on this post about a similar striped sweater she’d purchased from the Ines de la Fressange collection for Uniqlo. Thanks Ann. 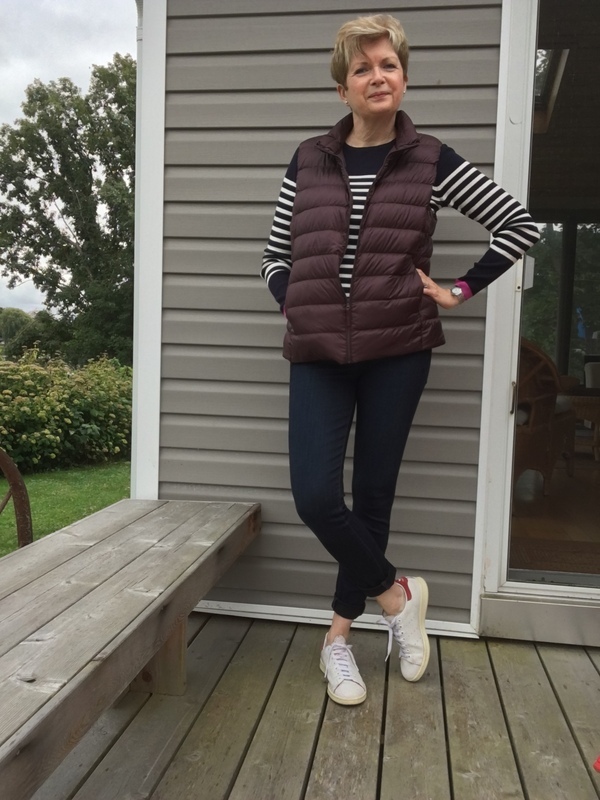 My new Uniqlo down vest with Paige jeans, and a navy striped Massimo Dutti sweater. I also decided that I will not make the same mistake I made packing for England last year. My error was bringing too many different outfits for evenings in London. I really need to remember to, “Keep it simple, Sue.” The idea of big, famous, foreign cities can still freak me out a little, until I get there, and feel stupid and silly for worrying. I should know that classic, well-fitting jeans or black pants, and a good blazer will take me pretty much anywhere. Or anywhere we’re likely to be dining. I despair sometimes, folks, I really do. Because, you know, despite being sixty-two, and travelling as much as I have, I can still feel like the kid from the farm. The kid from the farm goes to Italy. Here’s what made the cut yesterday. Starting in the upper left corner of the shot below. 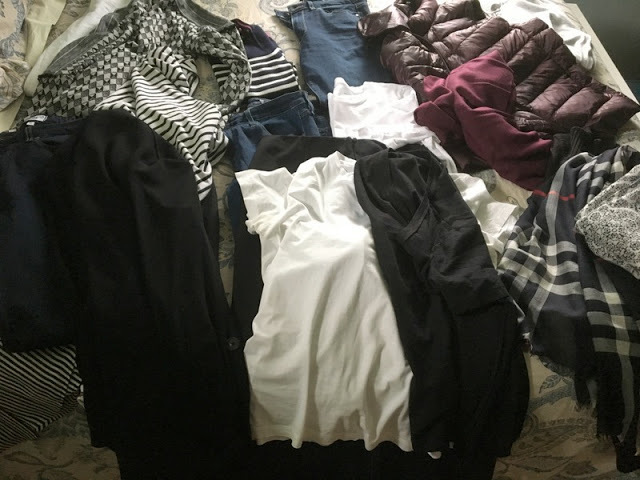 I’m packing: white jeans, black pants, three pairs of blue jeans, a black blazer, a black zippered sweater, one light pullover sweater, one light hoodie, one down vest, 3 long-sleeved tees, 4 short-sleeved tees, 3 scarves. Plus loafers, running shoes, and flat sandals. Plus my Moncler anorak and my Stan Smith Adidas which I’ll probably be wearing on the plane. I am not taking a dress, or a skirt, as I’d considered doing, and I’m packing only one pair of pants that might be considered even remotely “smart.” C’est tout. Or I guess I should say: questo è tutto. All laundered, pressed, folded and ready to pack. So, only two more sleeps until we leave. The garden is cleared. Thanks to everyone who helped us eat our way through all that produce. The fridge is almost empty. My lists are finished and mostly checked off. The laundry and ironing done, clothes all neatly folded and waiting to be packed. I’ve had my “trip haircut” and colour… thanks Carmen. Tomorrow I do the actual filling of the suitcases and carry-on bags. We travel with two small spinner, carry-on size, bags which we always check. And a tote bag each. I’m a very lean packer. Hubby is always astonished at what I can get into a small suitcase. We’re excited. And a little nervous, as we both always are until we get where we’re going. Despite my casual stance, I’m anything but chill. It feels a bit like the night before the first day of school when I was a kid. When the new Barbie lunch box and thermos sat waiting on the kitchen counter, the new book bag was all packed with sharpened pencils, and fresh notebooks (which we always called scribblers), and the new first day of school dress was pressed and hanging in my closet. What anticipation! Then… and now. But before I go I wanted to say a few words about all those oh-so-confident articles and posts, the ones that purport to tell us how to do things, like pack for travel. I’m always suspicious of people who have all the answers. I’m reminded of that scene from Pride and Prejudice when poor, flustered Maria Lucas insists she has to repack her case because the inimitable, and all-knowing, Lady Catherine de Bourgh has told her how to do it properly. Poor Lady Catherine, she ends up thwarted in every way. Her daughter does NOT marry Darcy, Elizabeth Bennet does, and, with a little encouragement from Elizabeth, Maria Lucas packs her bags to please herself. Ha. That’s what comes from trying to tell people what to do. That’s kind of rich, you might be saying, from someone who worked as a teacher for thirty years. But telling people what to do has never been my style, in or out of the classroom. I’m more of a “let’s have a conversation about this” kind of gal. Now it’s time for the part of the conversation where you talk, my friends. What’s your take on those bossy articles and posts that tell us the five, or ten, or fifteen things we absolutely need to do, or have, or whatever? Or tell us how you spend the last couple of nights before a big trip, when the decisions about what to pack are made, and everything is almost ready to go. Are you able to keep excitement tamped down to a reasonable level? P.S. My blog post schedule will be sketchy for the next while. But you can follow me here on Instagram. I’m sure I’ll be posting lots of photos. P.P.S. When I refer to “bossy blog posts” I am not talking about the truly helpful packing posts which simply discuss the travellers own experiences with packing. Like the ones at Une Femme d’Une Certain Âge or Materfamilias Writes. I love those ones. I love your comment about still feeling like the "girl from the farm." Having grown up in a big family with not lots of money, let's just say I was not the most sophisticated person in the room most of the time. While I've had a great career and traveled more than anyone in my family, I still feel like the girl from the lesser suburbs! Whew! I was glad when you excepted Sue at Une Femme from your comments (but I knew you weren't talking about her anyway). Look forward to seeing your posts. I love all your choices. Comfort, quality, but still polished and fashionable. Every big city is full of successful "girls and boys from tha farms"
It is not only about the clothes,it is about the posture and the way you wear your clothes and "fare la bella figura". So,have a wonderful trip! Buona gita! Your wardrobe looks just right…the colours aren't summery but you will have what you need if the weather is warm. I like to come home to fresh bedding so I dedicate some time to that before I leave. Keeps me away from my suitcase. I'm looking forward to your trip reports. Italy is so beautiful, and the cities so walkable, (and of course the food, the wine, the coffee, art, etc etc) I'm sure you will have a wonderful time! Have an absolutely marvelous time! It will be lovely and insightful to "see" Italy through your eyes! Have a very great trip and safe travels! Italy is like Paris allways a good idea! 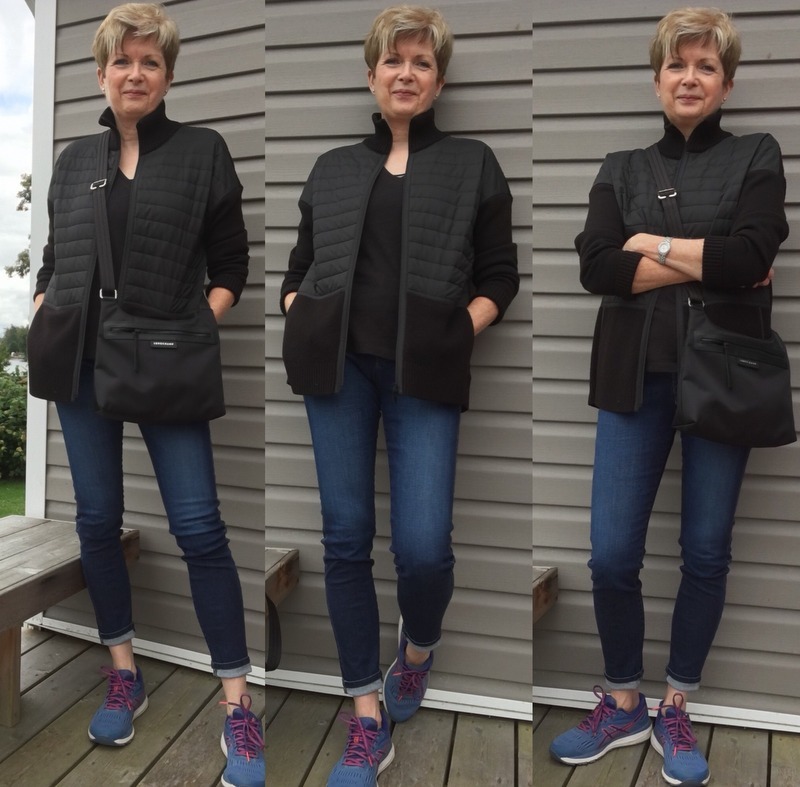 Love your uniqulo vest. 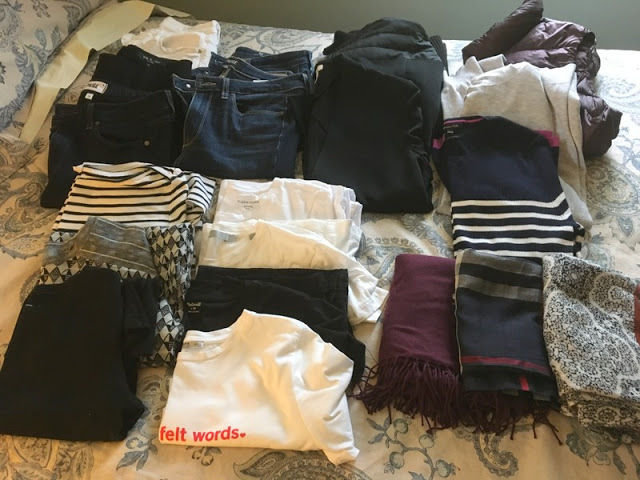 I tried rolling up my clothes for our trip to the States, and it worked out really well! I can't wait to follow along as you and Stu make your way through Italy, and I'm sure you'll fit in quite well in what you've packed. Your packing choices look excellent. It's always a dilemma when travelling somewhere unknown as far as the weather is concerned in what to choose but layers always seem the answer. I don't read many of those what to take when travelling other than the 2 you mention and then only as a guide as I like to do my own thing, usually opting for a bit more colour, often blue which goes with about everything. Safe travels and look forward to reading all about it on your return. Looks like your wardrobe choices are cohesive and will work out beautifully. Enjoy your trip! I read all the travel blog advice this spring before a trip to Europe and the one piece of advice that I should not have paid any attention to was to wear your heaviest or bulkiest clothes/shoes on the plane to have more room in your suitcase. That was fine in rainy cool Vancouver but I arrived to 25C in London and the next day we flew to Krakow, Poland, where it was 28C. But then I needed all those warm clothes again in Tallinn and Netherlands. It was how to fit them all in my bag while in those unseasonably hot places that was frustrating. Next time, I'll make sure all my clothing fits in the suitcase for the warmest possible scenario. I've so enjoyed following along. Saved what you packed as inspiration for me to pack better for our cruises. Thanks! Hi, only comment is to ditch 2 of the 3 jeans. Jeans can go weeks without washing and there are plenty of laundry services. Save space and weight, then have a great time. Can’t wait to hear about the trip when you get back. I'm still learning ( and mostly failing ) on how much to pack for a week away, let alone three ! Right now, im sitting in the Grand Rapids, Michigan, airport on my way home from a great visit to the city’s annual ArtPrize festival. I had such a wonderful time here that I want to urge everyone to check out this surprisingly vibrant community. And I say “surprisingly” only because of my recent ignorance. While here, I learned that Grand Rapids is the second most philanthropic (per capital) US city. And you can see the benefits of that civic spirit throughout the whole city. But back to Italy, which I hear also has a lot of art on display. 😉 Sue, I wish you and your husband an ideal trip with only enough surprises to make it happily adventurous. Interesting!! I'm just back from 2 weeks in France, where the coolest temperatures we had were in the low 20s and apart from that it hovered around 30. So of course I had a full alternative cool weather wardrobe as well as hot. Not helped by the fact that we were travelling by car (people carrier), so carry on wasn't an issue. Still, it was fairly 'capsule'. I've started packing a bit lighter tho and buying while I'm in France. I LOVE trying to emulate local style, even tho it doesn't always work on a broad-shouldered Scot. Do you buy while abroad? I've started keeping my buying for France, because I'm so bored with British clothes. We always make a big dent in the Bordeaux Uniqlo, for example. I agree with you! I've read bazillions of those posts telling me how I ought to pack, but they don't work for me. The last one told me to choose 3 colours and then pack just 10 items: 4 bottoms, 3 tops, and 3 jackets. Are you kidding me? Only 3 tops! No way! I do believe in packing light, but that's ridiculous. Like you, I consider what we're going to be doing and what the weather will probably be like, then I pack for comfort. I always end up taking more on road trips than when we fly simply because I have the space to do so. I loved the photo of the explosion on your spare bed! Our guest room doubles as a packing room too and you should have seen it earlier today! Now the suitcases are packed and we're ready to leave bright and early tomorrow morning. We'll be away for 3 weeks too, but our destination isn't as exotic or exciting as yours. We're off to Vancouver. The main purpose of this trip is to be with my 95 year old father who is having a minor surgical procedure later in the week. Oh my goodness, it has been A WHILE since I've been here!!! A month..no, can't be that long. Anyway, I just got back from two weeks in London. I hear you about the packing and outfits. I mean,you have to dress for yourself. Remember, where you are going no one even knows you! Or, for that matter, really cares! It has taken me years to realize that… (duh) Comfort is key and some spanking new, crisp outfit is not going to have comfort sewn into it. Ok, onto your latest post now.